Friends and family wandered in from the lounge, the golf course, and the hotel bar as the ceremony was about to begin in the glass-enclosed veranda at Barton Creek Resort. The windows looked out onto the the golf course below and the Texas hill country beyond. As the ceremony began, the Barton Strings quartet played jazzy, soothing music. The bridesmaids entered in navy dresses with bouquets of cream and pale pink roses, and David, the groom, turned his back to the crowd so that he wouldn't see Kristy, the bride, through the glass windows until the moment she stepped onto the aisle. His best man stood by to tell David the exact moment he could turn around to see his bride. And then he waited. and waited. and waited. It may have been the longest 60 seconds of his life, but as he cracked a joke and asked his best man "is she coming?" his best friend simply smiled and shrugged. The first couple of rows of friends and family erupted into laughter, and then Kristy entered the room, radiating beauty. While life and marriage are always full of surprises, we hope that our couples find that the things they wait for are the best life can offer. Congratulations to Kristy & David; we sincerely enjoyed being a part of your day and watching you interact with those you hold most dear. 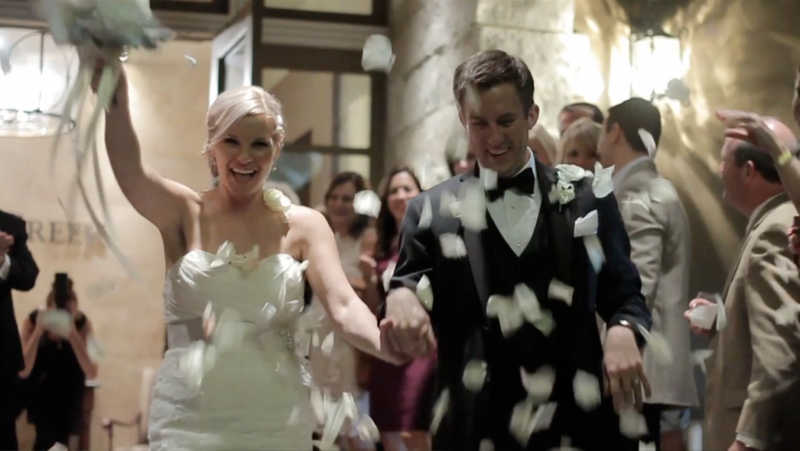 We hope your wedding video is a treasure you can enjoy for years to come and that it will remind you of these people who loved you so much that they celebrated this special occasion with you under the wide blue skies of Texas. If you're planning on hiring a wedding planner, Austin photographer, or any other kind of vendor, you'd be working with some upstanding folks if you hired any of the companies listed below. It was a true pleasure working with them.